The last few days before a passage are such a high! With energy and emotions running wild, bursting with anticipation, my mind exults at the thought of once again going to sea. I know of few other experiences in life that trigger the same flow of energy for me. That&apos;s why, after I step ashore, I am always impatiently awaiting the next opportunity. This time it was to be Oahu, Hawaii, to Seattle, Washington, aboard a brand-new boat on the last leg of her maiden voyage from New Zealand to Seattle. Wild Wind IVis a 60-foot Express Trawler catamaran, built in New Zealand by Pachoud MotorYachts. Basically a Malcolm Tennant design featuring displacement hulls, twin 330hp Cummins diesels and Hundested controllable-pitch props, she was fresh from Pachoud when she reached Oahu. I felt fortunate coming aboard for the last leg of the voyage, thinking that all the gremlins and bugs that tend to stow away on new boats would have hopefully by then been discovered and deep-sixed. Owner-designer-skipper Dennis Raedeke had spent the last six months working on the boat in New Zealand with the Pachoud builders. He and Dave Pachoud used Malcolm Tennant&apos;s design, and with modifications suggested by both men, molded her into an awesome seagoing creature. Dennis, his wife, Cam, and a crew of Dr. Rick and Rosanne Scott had just made the passage from Tahiti via the Tuamotos and the Marquesas to Oahu. The last 11 days from the Marquesas in rough weather had challenged their tenacity. After arriving in the Hawaiian islands in late afternoon, they had to wait out part of the night in the lee of an island to avoid some boisterous seas that tend to venture through the region before making landfall the next morning. Crewmate Jack Parchetta and I flew into Oahu on July 27, 2002, to join Dennis as a crew of three to now take Wild Wind IV to Seattle. Dennis and Cam, in usual fashion, had not only debugged and deep-sixed, but also had the boat fully fueled and provisioned. Before leaving us three to handle the next leg, Cam had prepared several hot dishes and placed them in the freezer-a gift we would come to appreciate when it was too rough to cook. Upon arrival we were advised that we might have up to a seven-day wait while Hurricane Faldo swept across our intended route. On the night of July 29, however, we received word that we had a window of opportunity to head north, between the demise of westward-bound Faldo, north of Oahu, and Hurricane Hernan, which was now heading slowly up the west coast of the Baja region. Knowing we would pass well ahead of Hernan, we elected to go. Under way on Aug. 30, aimed west under a grayish sky, we bade goodbye to the shoreline of Oahu. We were in the lee of the island and the seas were calm as our crew of three wondered what weather might lay ahead. Seattle bound with cupboards full, 1,800 gallons of diesel aboard and enthusiasm to spare, we rounded the west side of Oahu and headed straight north. Just a couple of hours out, a pod of five dolphins escorted us to the beginning of our route to the Strait of Juan De Fuca. The dolphins gave us Neptune&apos;s own blessing for the crossing. WWIV is a beautiful boat. 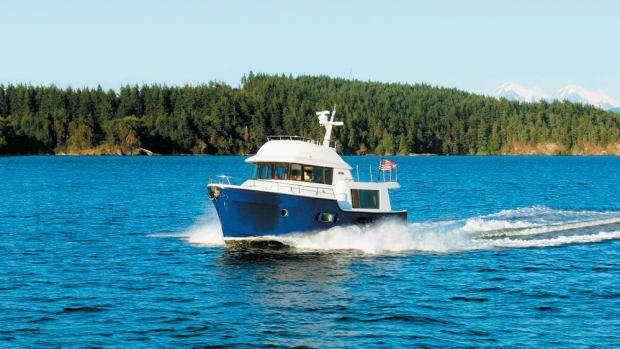 Her 60-foot displacement hulls and 25-foot beam provide little sense of motion when the seas are relatively calm. Designed to cruise on a single engine at 9-plus knots, she has an amazing range of approximately 3,500 miles, depending on her speed. When one needs to hurry her along, a top speed of about 21 knots provides a smooth, flat ride. Dennis, Cam and the Scotts had encountered some very rough water en route to Oahu, and Jack and I were about to be introduced to her performance in similar sea conditions. From the night of July 30 right through to the afternoon of Sept. 6 or 7, the wind was on the nose! In fact, for the first two days and nights we cruised between 5 and 7 knots under both engines, gaining the push of two props. WWIV runs better in a strong head sea with both props pushing. When down to a single engine, the prop on the dead engine is feathered to create less drag and to keep the shaft from turning. Our intent for this 2,700-mile passage was to cruise on single engines, alternating every 24 hours, primarily to conserve fuel and engine time. On a voyage of this length, mileage becomes an obstacle to reckon with. 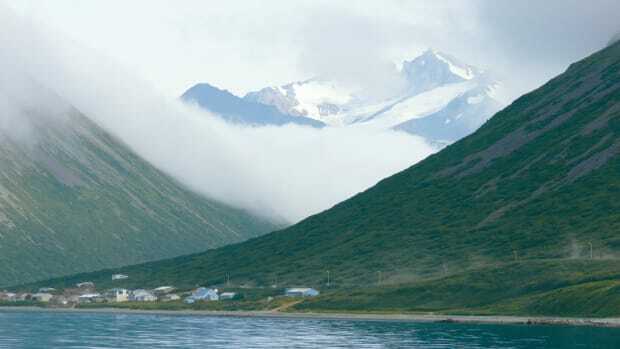 Our hopes had been to go straight north to pick up the backside of the Pacific high for calmer weather. The high proved elusive, however, and we didn&apos;t catch up to it until sometime in the ninth day, out at about 40 degrees N. Running the first three days on both engines and the first seven days and nights in anything but calm seas had us wondering how our fuel would hold up. The big cat&apos;s motion is tricky in rough water. The length and beam of this floating rectangle creates buoyant leverages between crests and troughs, which is tough on the sea legs. The stability is there and the lack of heeling is appreciated, but the quick recovery motions leveraged between the two hulls takes some adjusting. Never having been aboard such a craft under power, this was a brand-new experience for Jack and me. Dennis, of course, had already come some 7,000 miles from New Zealand, so he was more in tune with the boat. Our confidence in the boat&apos;s handling of the seas grew as we became familiar with WWIV&apos;s motions. She rises quickly in the bow, never burying into the oncoming sea. No matter the size or shape of the waves, she could handle them. After nearly seven days of weather on the nose or in beam seas, we became familiar with the sounds and could anticipate the coming motion. Our heavy load of fuel (roughly 6 tons) dampened some motion, but after the first few days we were all lamenting, "Will this damned wind be on the nose the whole trip?" Dennis had already experienced this same phenomenon most of the way from New Zealand. He said, "It&apos;s tough always going against the grain of the sea." We began to feel as though we&apos;d be going "uphill" all the way to Seattle! We averaged about 1.5 nm per gallon during the rougher weather. Later, in calmer weather, we did better than 2 nm per gallon. Later, fueling up in Seattle, we determined that we had arrived with enough fuel in our tanks to take us about 600 miles farther. In a near 3,000-mile route a cushion of only 600 miles seems a bit slight, but had we run into even more days of rough weather we had the option of reducing our speed to conserve more. Dennis proved repeatedly that by tweaking the variable props and rpm he could squeeze better mileage out, as indicated by our Flo-Scan gauges. This power train is impressively efficient. The catamaran&apos;s design provides an abundance of room inside and out-she is a luxury yacht. The master stateroom is large and elegantly finished in a variety of woods, with a queen-size walkaround bed and a portside head with oversize shower. Skylights, sound system and both heating and cooling top off the comfort. Another amidships cabin accommodates up to five additional guests and shares the starboard head and shower. The kitchen aboard WWIV cannot be referred to as a simple galley. It is elegantly laid out in delightful American cherry throughout. This boat has an abundance of electrical power to boost the microwave oven, full-size refrigerator, freestanding freezer and other appliances. A beautiful granitetopped breakfast bar separates the kitchen from the dining room, and leather-cushioned seats surround the dining table. Storage is maximized behind and beneath everything that is permanent aboard WWIV. We inventoried our leftovers in Seattle and determined we could easily return to Hawaii without reprovisioning! More details on this non-galley would make you want to jettison your own kitchen at home! The Pachoud yard does excellent work on the boats they build. The epoxy moldings are flawless, and everything seems to fit just right. The Raedekes&apos; cruising experience stands out in the manner in which WWIV is outfitted. Stainless rails surround the boat, and there is always something to hang onto, no matter what you are doing. This became apparent during the 10th day of our passage, as the three of us simultaneously wrestled two large mahimahi into submission, one on each stern. No easy task in a chop, but on completion of the job we still had a crew of three aboard! The sterns are separated from the large aft covered deck by heavy doors and railings, and between the sterns is a uniquely powered platform to raise and lower the smaller inflatable, outboardpowered dinghy, which becomes a swim platform when down. A larger, higher-powered inflatable (for waterskiing and larger loads) rests topside aft of the flybridge. The flybridge, just forward of and beneath the radar arch, has a commanding view to ease one&apos;s time at the helm. In fact, there are four command stations with full engine and steerage controls to accommodate ease of docking. 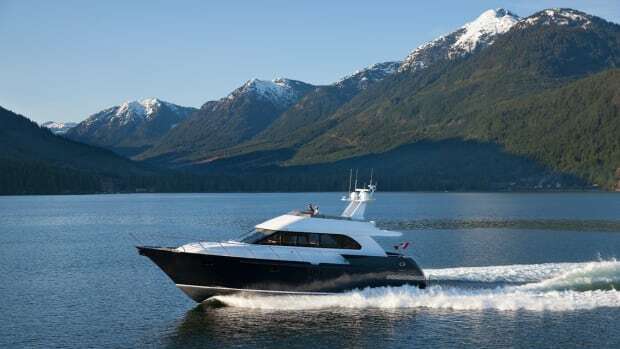 The indoor helm amidships in the main pilothouse, the flybridge and both rear quarters on the stern all have full throttle, shift and steerage controls. My initial experience at the helm was confusing. No tiller, no wheel-just a dual set of throttles and toggle switches. One steers by nudging a toggle to the left or right, by dialing the degrees-knob on the autopilot or with the engines and their variable pitch props. This is a state-of-the-art boat. It grew on me quickly, and I soon began to wonder why so many boats still have wheels for steerage. While at the helm during my watch I could easily imagine I was flying some exotic aircraft. The numerous gauges, switches, radars and computerized navigational screens are high-tech afloat. We quickly established daily routines. Watches were three hours on, six hours off, and during the day we were all up and active. Jack and I both like to cook, so we took the galley duties. Dennis kept the boat running smoothly, sharing knowledge of the myriad tasks when either of us expressed interest. Jack and I would disappear aft about 5 p.m. for our mandatory daily martini prior to galley functions, while Dennis limited himself to a rare glass of wine while under way. We dined well, gained weight and shared our culinary inventions daily. I admit there was some hesitancy when I offered my mates oatmeal smothered in fried onions and brown sugar, but we seldom had a turndown on vittles. We were seven days into our passage before we encountered another ship. The closer we got to Seattle the more we saw, both on radar and visibly. They were mostly container ships or tankers, then a little more variety near the straits by Victoria, British Columbia. We could pick up the big ships from about 30 miles away. It was comforting activity to see during the night watches, and I could use nearly the entire three hours of my shift keeping track of a ship or two. The radar also provided us with a great view of weather, squalls and cloud patterns. The luxury of showers when desired, sleep when necessary, an abundance and variety of food (including the fresh-caught mahimahi), and the unlimited stimulation provided by the open sea turned this passage into a voyage we will not soon forget. Jack, a pilot and 3M executive in marine sales who had never made a long voyage, proved to be a trooper with whom I&apos;d go to sea anytime. His piloting experience and marine knowledge was great background for our navigating and weather interpretation. Dennis&apos; 30 years of longdistance sailing, a round-the-world trip and designing and building boats buoyed our confidence dramatically. We have all stated, both during and since the cruise, that we had an ideal crew aboard for this trip. With the combination of weather we had on this passage, one could either love it or hate it. Fortunately, we loved it. Had we been bound downwind, the trip would have been easy! One late afternoon following seas developed from 12 to 16 feet, and WWIV practically ignored it. Downwind under autopilot, she&apos;s a dream! Problems? Yes, we had some. Beam seas against the 60-foot vertical wall of the windward hull made some dramatic impacts, at times repeatedly for hours. During one such wallop, the vertical metal pipe on which the skipper&apos;s throne sits decided it had had enough. It broke off just above the anchor-base mounted to the floor. For a few hours we stood at the helm. It took several attempts over the better part of three days before Dennis engineered a field repair so we could once again sit confidently, with no fear of crashing to the floor during our watches. One very dark midnight, the boat slowed to an idle. It was Dennis&apos; watch, and I was just getting dressed to take over. I asked Dennis why we had stopped. He replied, "I don&apos;t know. We just went from about 8 knots down to 2 very quickly." I didn&apos;t like the sound of that. Here we three were, hanging over the stern, "one hand for you, one for the boat" fashion, shining flashlights through black water onto the props and rudders, trying to find the suspect fishnet or long line. I remember thinking, "We sure are a long way from nowhere, it sure is dark and I sure wonder how this is going to turn out!" Being in the middle of the ocean at night in a breeze when the boat slows for no apparent reason can do strange things to your head. We found nothing we had expected to find, so in a few minutes went topside and cranked up again. After shifting from forward into reverse a couple of times we throttled up, and our speed returned to normal. The next morning we voted and elected that we had encountered a giant squid in the mid-Pacific, but had successfully scared him off! Across Our Rhumb This very day seven moved across our bow, Black white gleaming from their dorsals streaming, Gargantuan, sleek and strong, steadily flowing along, No time for man this day, That&apos;s the orca way. 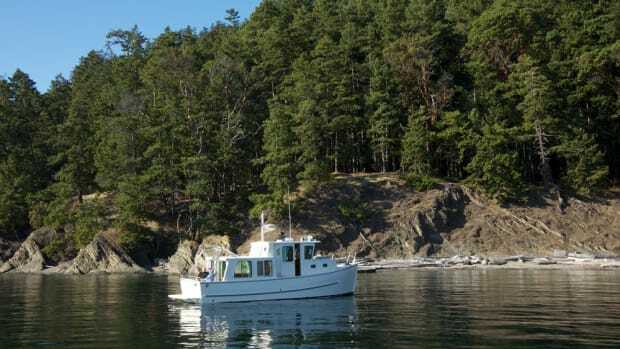 At about 10 a.m. on the 14th day of our passage, we entered the Strait of Juan De Fuca. I was flooded with memories of the many Swiftshure races I had sailed while working with A&T Ski Company in Seattle and living on Vashon Island during the 1970s. Dennis and I had sailed together on one of those Swiftshures, aboard the good sloop Cirrus, now harbored on Vashon Island. We quickly plugged ourselves into the Tofino radio system, which tracks boat traffic on the sound and straits. Dennis radioed ahead to Port Angeles to find a possible berth for an overnight before heading on into Seattle. If there is a flaw in this boat, it&apos;s finding an abnormal berth in a normal marina. You tell the harbormaster about the boat you are bringing in, but upon arrival his eyes sure get big! The twin-hulled rectangle seems to inexplicably expand in the confines of the average marina. After a welcome hike to a Port Angeles pub and a welcome-home meal with spirits, we rode a cab back to the marina. Corralled as she was, WWIV appeared reluctantly berthed and restless to return to sea. The three of us shared that emotion, and the next morning, cast off on the last short leg of our voyage into Seattle. I almost always regret the end of a passage, and this trip had been a delightful experience for all of us. WWIV is a trendsetter. She will tour up and down the Inside Passage to Alaska for the next year or two. After that, she&apos;ll travel down the West Coast, through the Panama Canal, north to Belize, across the Gulf, up the East Coast around Newfoundland, into the St. Lawrence Seaway and home to the greatest of lakes. The Raedekes live in St. Croix Falls, Wisconsin, which is about 150 miles south of Wild Wind IV&apos;s berth in Washburn harbor, Wisconsin, on Lake Superior.